i first went to taverna 750 a couple of years ago... before le blog. since then, i've been wanting to go back. and so on the night that the defense of marriage act was struck down & prop 8 was dismissed, what better place to dine than chicago's boystown? n. halsted st. & w. cornelia ave. to be precise ... at taverna 750. "taverna 750 is the best of old school italian w/ a contemporary flair. proprietor paul d. cannella is bringing back his grandfather paul j. loverde's & uncle chuckie abruzzini's classic italian recipes from his restaurant on grand avenue in the 50s." sounds ideal. everything at taverna 750 is small places (of course), so perfect for sharing. my friend & i shared a salad, three side dishes & an entree. 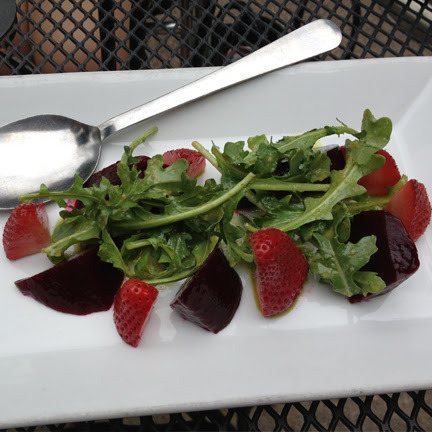 fresh strawberries, roasted baby beets, basil puree, citrus dressing & baby arugula. a perfect, light summer salad. delish. 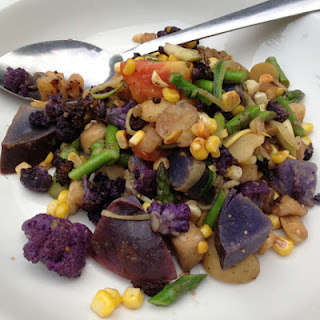 i had never had purple potatoes or purple cauliflower, so this was très exciting. amazing deep fried goodness. 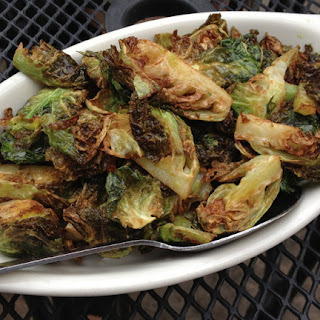 i'm not sure there is a better way to prepare brussels sprouts than deep frying. almost makes me want to try to do this myself. almost. 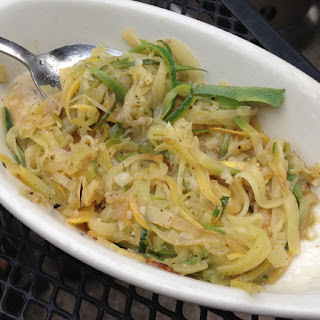 for some reason, my friend & i were expecting spaghetti squash, but instead got squash in the shape of spaghetti. we mixed this with a bit of the spring veggies side ... awesome. 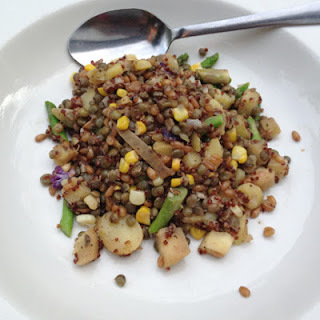 quinoa, wheatberries, buckwheat, seasonal vegetables & lemon vinaigrette. our favorite plate of the evening. sooo flavorful thanks to some black pepper & one other mystery ingredient we couldn't pinpoint. i'm normally not a fan of quinoa, but this combo of various grains was lovely. upon first glancing at the taverna 750 menu, i wasn't certain that there would be that much vegan stuff. but there ended up being plenty of options for us. our server called us his "vegan guinea pigs," so it sounds like they don't get many of our kind there. but that's okay. the food was great & the wine was delicious.